Please read this agreement carefully before accessing or using this site. By accessing or using this site, you agree to be bound by this agreement. The information and services on this site are provided by Ivacationonline.com, an Ohio Limited Liability Company, its customers, and its vendors. By accessing and using this site you agree to be bound by the terms and conditions set forth below. 1. Ivacationonline.com, LLC provides rental property owners (“Owners”) with a rental software, selected services from vendors that may be helpful in advertising their properties, and a forum in which to advertise their properties to interested potential guests (“Guest”). Ivacationonline.com, LLC provides potential guests a forum to review properties which they may be interested in renting, as well as links to selected vendors for services that the potential guests may be interested in. 2. The Ivacationonline.com, LLC rental software allows Owners to edit a lease after it has been confirmed. The system will email the Guest about the edit of the lease and it is up to the Guest to contest a change if the Guest does not agree to the change. To contest a change to the lease, the Guest needs to contact the Owner directly. The Guest should not contact Ivacationonline.com, LLC to contest a change in a lease. Any changes made to a confirmed lease without the consent of the Guest are void. Any changes made after the Guest arrives at the rental property are void. Any changes to a confirmed lease that are not contested prior to the Guest arriving at the rental property are deemed accepted. 3. Owners are solely responsible for the accuracy of the information on their property listings. Owners who provide photos used on the site assert the photo(s) is/are true and accurate depictions of the current condition of the property they claim to represent, and that Owner owns the publishing rights to the photo(s). When booking a rental online, the Owner and Guest confirm that they are willing to complete the transaction. No Guest shall book a unit online without the full intention of completing the transaction and renting the property identified on the site. Ivacationonline.com, LLC has provided a link to a vendor for the purchase of travel insurance in the event the Guest has concerns about the Guest’s future ability to complete the transaction due to unexpected circumstances. 4. It is the responsibility of the Owner and the Guest to complete the rental transaction. Ivacationonline.com, LLC does not guarantee the accuracy of any representation made by or posted by an Owner, or any agent of an Owner. All forms, leases, and other documents used in connection with the rental of property are generated by the Owner and/or the Guest. Any forms or model agreements are for illustration purposes only, and Ivacationonline.com, LLC makes no representations that such forms or blank agreements conform with any particular state or local laws or regulations. It is the responsibility of the Guest and Owner to ensure all leases, forms, and other executed documents comply with state and local laws and regulations. Ivacationonline.com, LLC, is not responsible for ensuring such documents comply with state or local laws and regulations. 5. Ivacationonline.com, LLC has not and will not provide legal advice to any person or entity. Should you have a legal question, Ivacationonline.com, LLC strongly recommends that you consult with an attorney. iii. Regularly scheduled and special occasion maintenance, repairs, and/or upgrades. You further agree that any interruption of service shall be made solely at the discretion of Ivacationonline.com, LLC and Ivacatationonline.com, LLC shall not be liable to you or any third party for any interruption or termination of service, including but not limited to any claims for of lost business, lost business opportunity, or lost bookings. iii. Any transaction you enter in connection to or as a result of your access and/or use of this site and its services. 8. Ivacationonline.com, LLC and its suppliers may make changes and improvements in the information, services, products, presentation, and other materials found on this site, or may terminate the site, at any time without notice. 9. Ivacationonline.com, LLC may modify this agreement and the terms and conditions of this agreement at any time without notice. Accordingly, you agree to review the site, including but not limited to the “Terms and Conditions” page, regularly, and your continued access and use of the site shall be deemed acceptance of any modifications of the agreement made by Ivacationonline.com, LLC. Rates and conditions are subject to change without prior notice. 10. All materials on this site, including property information, layout, site organization, and photos, are owned and copyrighted by Ivacationonline.com, LLC, or its suppliers, and may be accessed, downloaded, or printed, only for your personal, non-commercial use. You may not copy, distribute, or transfer any material on this site (except for Owners transfer of property information and photos), without prior express written consent from Ivacationonline.com, LLC. 11. This agreement and the resolution to any dispute related to or involving this agreement shall be governed by the laws of the State of Ohio, without giving effect to any principles of conflicts of law. You hereby agree and assent to the exclusive jurisdiction of the Hamilton County (Ohio) Court of Common Pleas as the appropriate forum to litigate any disputes, actions, or claims, relating to or involving this agreement or the access and/or use of this site. 12. This site may include links to other Internet sites solely as a convenience to the user. Ivacationonline.com does not endorse any such sites or the information, material, products, or services contained therein or accessible through such sites. You access and use such sites solely at your own risk. 13. The Ivacationonline.com, LLC software requires the Guest to enter its email address upon booking a property. The Owner will communicate to the Guest via the provided email address using the Ivacationonline.com, LLC software. This may include Confirmation emails, terms and conditions of the property rental agreement, access information, thank you emails, marketing, continuing contact, and survey emails. If a Guest does not want to receive marketing emails, the Guest may OPT OUT of marketing emails by selecting the OPT OUT option on the site. Owners agree to not send marketing emails to Guests who OPT OUT. 14. Ivacationonline.com, LLC does not sell or share emails of any person. 1. Ivacationonline.com, LLC strongly recommends that Guests ask for and demand receipt of a written notice of the Refund/Cancellation policy of any Owner it intends to transact with prior to booking a property for rental. Ivacationonline.com, LLC will not be responsible for the refund of any booking fees or rental fees for any reason. 2. Guests assume all liability for use of any information found on this site. Ivacationonline.com, LLC disclaims all statements found on any listing found on this or any other site. 3. Ivacationonline.com, LLC, through its suppliers and vendors, may offer Guests a Travel Insurance Policy. Ivacationonline.com, LLC is not an insurer, and all policies are drafted, sold, and provided by third party vendors, who may pay Ivacationonline.com, LLC a fee. You agree to provide truthful information to any party collecting data and information needed to provide such a policy or process a travel insurance policy claim. vii. Ask the Owner where else the property is advertised. 5. Ivacationonline.com, LLC AND ITS SUPPLIERS DISCLAIM ALL EXPRESS AND IMPLIED WARRANTIES WITH REGARD TO THE INFORMATION, SERVICES, AND MATERIALS CONTAINED ON THIS SITE, INCLUDING WITHOUT LIMITATION ANY IMPLIED WARRANTIES OF MERCHANTABILITY, FITNESS FOR A PARTICULAR PURPOSE, AND NON-INFRINGEMENT. ALL SUCH INFORMATION, SERVICES, AND MATERIALS, ARE PROVIDED “AS-IS” AND “AS AVAIALABLE” WITHOUT WARRANTY OF ANY KIND. IN NO EVENT SHALL Ivacationonline.com, LLC, OR ITS SUPPLIERS BE LIABLE FOR ANY SPECIAL, INCIDENTAL, EXEMPLARY, OR CONSEQUENTIAL DAMAGES, OR ANY DAMAGES WHATSOEVER RESULTING FROM A LOSS OF USE, BUSINESS, DATA, OR PROFITS, WHETHER BASED ON BREACH OF CONTRACT, TORT (INCLUDING NEGLIGENCE), PRODUCT LIABILITY, OR OTHER OTHERWISE. YOU ACKNOWLEDGE AND AGREE THAT THE LIMITATIONS SET FORTH ABOVE ARE FUNDAMENTAL ELEMENTS OF THIS AGREEMENT AND THE SITE WOULD NOT BE PROVIDED TO YOU ABSENT SUCH LIMITATIONS. SOME STATE STATUTES MAY APPLY REGARDING LIMITATION OF LIABILITY. 1. Ivacationonline.com, LLC, reserves the right to reject any add or other content at our sole discretion. Once material has been submitted, edited, and posted on Ivacationonline.com, LLC’s website, it becomes the property of Ivacationonline.com, LLC and may not be copied from the site without express written permission from Ivacationonline.com, LLC. 2. Ivacationonline.com, LLC offers a free 30 day trial to evaluate its software. Full access is given to the software during the 30 day trial. An owner may only receive one free trial period. Owners may purchase a subscription plan anytime during the 30 day trial for the then current subscription price(s). If a subscription is purchased during the trial period, the remaining days of the free trial period will continue and the subscription period will begin at the expiration of the trial period. By purchasing a subscription you are agreeing that you are satisfied with the software and the services offered by Ivacationonline.com, LLC and agree to our no refund policy. The no refund policy means that once a subscription is purchased, the purchase price will not be refunded for any reason. Should you have any questions or concerns about the software or services offered, you should not purchase a subscription until those questions or concerns are resolved. 3. Subscriptions can be purchased with or without an extended warranty plan. If you do not purchase a subscription by the expiration of the trial period, your access to the software and site is immediately revoked. The annual rates of the various subscription fees and plans are subject to change, and are not refundable. You may cancel your subscription at any time and have your information withdrawn from the site, but the subscription fee is not refundable or subject to proration. i. Owners may purchase limited software and extended service warranty protection on a per booking basis. Ivacationonline.com, LLC provides software, information, views, and services that assists you in successfully renting your vacation property. While we do not guarantee that the software and services provided will create a profit, their purpose is to make the process of renting your property easier and more likely to create a profit for the Owner. Rather than build a flat warranty fee into the annual subscription, Ivacationonline.com, LLC offers a per booking warranty option for Owners. In that way, Owners who have fewer rentals pay less than those Owners who have frequent rentals. Guests who will not damage your property. 1. An Owner may pass along the cost of the extended warranty to the Guest. Should an Owner choose to pass along the cost of the extended warranty to the Guest, the Owner must either collect the extended warranty cost from the Guest and remit it to Ivacationonline.com, LLC prior to the rental or configure to the software provided by Ivacationonline.com to automatically bill the Guest the extended warranty fee and remit it to Ivacationonline.com, LLC. Owners are not required to pass along the cost of the extended warranty to Guests, and if an Owner chooses not to pass along the cost, the Owner must personally remit the warranty fee to Ivacationonline.com, LLC prior the Guest arriving at the property in order to participate in the Extended Warranty Plan for that particular Guest. iii. The limit of the extended warranty in which Ivacationonline.com, LLC will warrant the fair treatment of rental property listed on our site and used by Guests of our site is $ 3,000.00 per booking. Any damage caused by a qualifying Guest beyond $ 3,000.00 will be the responsibility of the Owner. Should an Owner report that a Guest or Guests damaged the rental property after renting the property using the Ivacationonline.com, LLC software and website, Ivacationonline.com, LLC will conduct an investigation of the report. 1. The report must be submitted to us within 14 days of the termination of the rental period. A paid receipt evidencing that the guest stayed at the property in question must be submitted to us within 60 days of the termination of the rental period. 2. Owner must provide all documentation and access requested by Ivacationonline.com, LLC in its investigation. Owner agrees to fully complete any and all forms provided to Owner by Ivacationonline.com, LLC in the course of its investigation. The documentation must demonstrate that the damage relates to the service provided by Ivacationonline.com, to wit: that the property was damaged by a Guest. 3. If the damage claimed by the owner is likely, in the sole determination of Ivacationonline.com, LLC, to be the result of intentional and/or criminal activity, the Owner must report the criminal activities to the appropriate law enforcement agencies in a timely manner, fully comply with all law enforcement requests, and fully cooperate with any investigation and prosecution by law enforcement (including appearing to testify). a. Failure to report suspected criminal activity, failure to fully comply with law enforcement requests pertinent to the investigation and prosecution of suspected criminal activity, or failure to otherwise fully cooperate with criminal investigation and prosecution related to the damage voids the warranty. b. Should the offending Guest or the Guest’s invitees be found criminally liable for creating the damage and the criminal is Court ordered to pay restitution, Ivacationonline.com, LLC is not required to pay Owner any damages under the limited warranty, as it would likely result in a windfall for Owner, rather than make the Owner whole. 4. Ivacationonline.com, LLC will take a reasonable amount of time in investigating warranty claims, and may toll its investigation while a criminal investigation and/or prosecution is pending. 5. THE LIMIT ON EACH WARRANTY CLAIM IS $ 3,000.00 AND WARRANTY CLAIMS ARE LIMITED TO PROPERTY DAMAGE ONLY, AND ONLY PROPERTY DAMAGE CREATED BY QUALIFIED GUESTS ON PROPERTY LISTED AND USING THE Ivacationonline.com, SOFTWARE AND WEBSITE. ALL OTHER WARRANTIES, EXPRESS OR IMPLIED ARE HEREBY DISCLAIMED. IN NO EVENT SHALL Ivacationonline.com, LLC, BE LIABLE FOR ANY SPECIAL, INCIDENTAL, EXEMPLARY, OR CONSEQUENTIAL DAMAGES, OR ANY DAMAGES WHATSOEVER RESULTING FROM A LOSS OF USE, BUSINESS, DATA, OR PROFITS, WHETHER BASED ON BREACH OF CONTRACT, TORT (INCLUDING NEGLIGENCE), PRODUCT LIABILITY, OR OTHER OTHERWISE. YOU ACKNOWLEDGE AND AGREE THAT THE LIMITATIONS SET FORTH ABOVE ARE FUNDAMENTAL ELEMENTS OF THIS AGREEMENT AND THE SITE WOULD NOT BE PROVIDED TO YOU ABSENT SUCH LIMITATIONS. iv. Ivacationonline.com, LLC does not provide property insurance. We recommend that each Owner maintain adequate property insurance for each and every property it rents and take adequate precautions to keep its properties safe and a secure. The extended warranty is not insurance. v. The limited warranty is limited not only to the maximum amount warranted ($ 3,000.00) but also to property damage caused by Guests (and their invitees) booking the property through the site and software. Damage caused by acts of God, nature, normal wear and tear, person(s) on the property who did not book through the Site or software, or any other cause other than the mistreatment of the property from a Guest, is not covered under the limited warranty. vi. Owners using the Ivacationonline.com LLC service for property in the states of Arizona, West Virginia, Connecticut, and New York are excluded from purchasing the extended warranty plan. 4. Owners are responsible for drafting the own lease agreements and other documents. Owners are further responsible for investigating and adhering to all federal, state, and local regulations, ordinances, and laws, including but not limited to permit regulations, licensing regulation, taxing laws, and safety regulations and laws. 5. Ivacationonline.com, LLC may, from time to time, offer advice on managing vacation rentals. This information is not a guarantee of success or profit in any way. You are not obligated to follow any advice offered. Ivacationonline.com, LLC encourages you to seek advice from multiple sources and independently research advertising and pricing options. Any advice offered through Ivacationonline.com, LLC or its vendors is merely general advice and is not tailored to your property or properties. Such advice may be based on incomplete information about your particular circumstances and without the benefit of research on your particular market and needs. You rely on advice offered by Ivacationonline.com, LLC at your own risk, and you agree that Ivacationonline.com, LLC shall not be liable for any claims, damages, or losses, you may incur as a result of reliance on advice given to you by Ivacationonline.com, LLC. Please read this agreement carefully before accessing or using this site. By accessing or using this site, you agree to be bound by this agreement. The information and services on this site are provided by ivacationonline.com LLC, its clients and its suppliers. By accessing and using this site, you agree to the terms and conditions below. ivacationonline.com LLC reserves the right to reject or edit any ad submitted at our sole discretion. Once material has been submitted, edited and posted onivacationonline.com LLC, it becomes the property of ivacationonline.com LLC and its affiliated sites and may not be copied from ivacationonline.com LLC without written permission. The ivacationonline.com vacation rental software allows the owner/manager of the property to edit a lease after it has been CONFIRMED. The system will email the guest about the edit of the lease and it is up to the guest to contest a change if they do not agree with the changes. The guest needs to contact the owner/manager directly and not ivacationonline.com LLC to contest the changes. Any changes not contested by the guest will be deemed as accepted by the guest. Any changes made to a lease WITHOUT the consent of the guest can void the lease. Owners: when you join ivacationonline.com you will be asked to pay a yearly fee after your 30 day FREE Trial. If you add units during your subscription your rate will go up according to our rate structure. Once you pay your yearly fee, you may cancel your subscription at anytime. There will be no refunds given on a prorated basis if you cancel before your subscription expires. ivacationonline.com LLC offers a free 30 day trial to evaluate the software. Full access is given to the system during the 30 day trial. Owners may join anytime during the 30 day trial. Any remaining days of the free trial will be credited to your account if you join before the 30 days are up. By joining and paying the online fee you are agreeing that you are satisfied with the software and the services of ivacationonline.com LLC and agree to our no refund policy. If you have any questions about the software please do not join until your questions have been resolved. There is a no refund policy in place after you join and pay the yearly fee. Owners are responsible for the accuracy of the information on their property listings. Owners who provide photos to be used assert that the photos are their own property and these same owners have the publishing rights to said photos. ivacationonline.com LLC is not responsible for any action, or omission of action, by any renter obtained by the use of this site. When booking a rental online, the renter and owner confirm that they are willing to complete that transaction. No guest shall book a unit online without the full intentions of renting that unit. 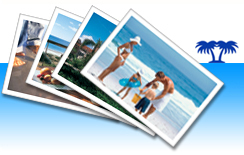 Travel Insurance is available to handle most complications that arise from doing business in the vacation industry. Information contained in advertisements is neither confirmed nor warranted by ivacationonline.com LLC. Confirmation of information printed herein is the responsibility of the renting party. ivacationonline.com LLC highly recommends that renters ask for and receive, review and understand a written notice of the Refund/Cancellation policy from the advertiser. ivacationonline.com LLC is not responsible for the refund of rental fees for any reason. Renters assume all liability for use of any information found in the ivacationonline.com LLC Internet publication. By using or continuing to use the services of ivacationonline.com LLC you agree to the terms and conditions of this disclaimer. ivacationonline.com LLC provides a service to the owners for a fee. The owners are responsible for the information posted on their listing. ivacationonline.com LLC provides a service to unite the guest and the owner. It is the guest and owners responsibility to perform the rental transaction. ivacationonline.com LLC does not represent the information posted on any of the owner’s listings. Any forms used by the Owner and Guest to complete a rental transaction are the responsibility of the guest and owner to verify with their local and state laws that such agreement is biding and lawful. ivacationonline.com LLC is not responsibly for local or state laws where the property may be located. ivacationonline.com LLC may provide forms and agreements to use on this site but are for illustration purposes only. Each owner or guest is responsible for their forms and to make sure they are binding in their state and city. ivacationonline.com LLC does not give any legal advice to either party. ivacationonline.com LLC may offer to the guest or renter a Travel Insurance Policy. ivacationonline.com LLC may receive a fee for this service. The Owner and Guest agree to provide truthful information in collecting any data needed to process a claim. The owner may be requested to post certain regulations about the offer of Travel Insurance on this site. regularly scheduled and special occasion maintencence, repairs, and/or upgrades. You further agree that any interruption of service shall be made solely at ivacationonline.com LLC's discretion, and ivacationonline.com LLC shall not be liable to you or any third party for any interruption or termination of service, including, but not limited to any claims of loss of business, lost business opportunity, or lost bookings. ivacationonline.com LLC will use its best efforts to provide advance notice, when possible, of any anticipated interruption of service or access, but shall not be liable to you or any third party for failure to provide such advance notice. ivacationonline.com LLC and it's partners and contractors may from time to time offer advice on running vacation rentals. This information is not a guarantee of success in any way. This advice may be where to advertise your property, how to price your property, what improvements to make to your property to make it more attractive and profitable. This is only advice and there is no guarantee of success if you follow this advice. ivacationonline.com LLC encourages you to seek advice from multiple sources and independently research your advertising and pricing options. Any advice given by ivacationonline.com LLC is general advice. Such advice may be based on incomplete information about your particular circumstances and without benefit of research of your particular needs. You rely on advice offered by ivacationonline.com LLC, at your own risk, and you agree that ivacationonline.com, LLC shall not be liable for any losses you incur or claims made against you as a result of your reliance on any advice given to you ivacationonline.com LLC. Obtain references from past guest. Visual inspection by requesting additional photos from the owner. Request a copy of all owners' policies. These may be listed on the site of emailed to you. Insist on a property lease/rental agreement as provided on the listing. Request a phone number to directly reach the owner/manager if one is not provided on the listing. Request the street address of the property rented and look it up on one of the Internet-based map sites, such asMapQuestorGoogle Maps. Ask the owner where else the property is advertised on the Internet. For additional protection, check with the local Better Business Bureaus. ivacationonline.com LLC AND IT’S SUPPLIERS DISCLAIM ALL EXPRESS AND IMPLIED WARRANTIES WITH REGARD TO THE INFORMATION, SERVICES, AND MATERIALS CONTAINED ON THIS SITE, INCLUDING WITHOUT LIMITATION ANY IMPLIED WARRANTIES OF MERCHANTABILITY, FITNESS FOR A PARTICULAR PURPOSE, AND NON-INFRINGEMENT. ALL SUCH INFORMATION, SERVICES, AND MATERIALS ARE PROVIDED "AS IS" AND "AS AVAILABLE" WITHOUT WARRANTY OF ANY KIND. IN NO EVENT SHALL ivacationonline.com LLC OR ITS SUPPLIERS BE LIABLE FOR ANY SPECIAL, INDIRECT, PUNITIVE, INCIDENTAL, EXEMPLARY OR CONSEQUENTIAL DAMAGES, OR ANY DAMAGES WHATSOEVER RESULTING FROM LOSS OF USE, BUSINESS, DATA OR PROFITS, LITIGATION AND THE LIKE, WHETHER BASED ON BREACH OF CONTRACT, TORT (INCLUDING NEGLIGENCE), PRODUCT LIABILITY OR OTHERWISE, EVEN IF ADVISED OF THE POSSIBILITY OF SUCH DAMAGES. YOU ACKNOWLEDGE AND AGREE THAT THE LIMITATIONS SET FORTH ABOVE ARE FUNDAMENTAL ELEMENTS OF THIS AGREEMENT AND THE SITE WOULD NOT BE PROVIDED TO YOU ABSENT SUCH LIMITATIONS. SOME STATE STATUTES MIGHT APPLY REGARDING LIMITATION OF LIABILITY. You agree to indemnify, defend and hold harmless ivacationonline.com LLC, its affiliates and suppliers from any liability, loss, claim and expense (including attorneys' reasonable fees) related to (i) your violation of this agreement, and (ii) your posting of material to this site. All materials on this site, including property information and photos, (as well as the organization and layout of the site) are owned and copyrighted by ivacationonline.com LLC or its suppliers and may be accessed, downloaded or printed for your personal non-commercial use only. Without the prior written permission of ivacationonline.com LLC or its suppliers, you may not copy, distribute or transfer any material on this site, except for property information and photos, for in whole or in part. ivacationonline.com LLC and its suppliers may make improvements or changes in the information, services, products, and other materials on this site, or terminate this site, at any time without notice. ivacationonline.com LLC may modify this agreement at any time, and such modifications shall be effective immediately upon posting of the modified agreement. Accordingly, you agree to review the agreement periodically, and your continued access or use of this site shall be deemed your acceptance of the modified agreement. Publisher, homeowners and agencies are not responsible for typographic errors; and rates and conditions are subject to change without notice. This agreement and the resolution of any dispute related to this Agreement or the site shall be governed by and construed in accordance with the laws of Ohio, without giving effect to any principles of conflicts of law. ivacationonline.com LLC failure to insist upon strict enforcement of any provision of this agreement shall not be construed as a waiver of any provision or right. Any legal action or proceeding between ivacationonline.com LLC and you related to this agreement shall be brought exclusively in a federal or state court of competent jurisdiction sitting in Ohio. This site may include links to other Internet sites solely as a convenience to users. ivacationonline.com LLC does not endorse any such sites or the information, material, products or services contained on or accessible through the sites, and you access and use such sites, including information, material, products and services therein, solely at your own risk. The ivacaitononline.com patent pending online reservation software needs the guest to enter their email upon booking a property. The owner will communicate through that email with the guest by using the ivacaitononline.com system. This may include but not be limited to the CONFIRMATION emails, TERMS and CONDITIONS, ACCESS information and THANK YOU or SURVEY emails. Ivacationonline.com also has a marketing system so the owner may stay in contact with the guest after the transaction has completed. The owners may on occasion send emails to the guest with this marketing system. There is an OPT OUT button if the guest does not want to be contacted by the owner in this manner. The owners may not contact the guest after they have opted out with any marketing emails. ivacationonline.com LLC does not sell or share the emails of any person with anyone. The owners may not add emails to the marketing system if the person has not given them permission. If an owner violates this policy they risk have the account terminated. This will be at the sole decision of ivacationonline.com LLC. By booking online or being a client of ivacaitononline.com you agree to these terms and conditions. Use of this website constitutes acceptance of the ivacationonline.com LLC Terms & Conditions.